Q: I recently read your article on the remodeled teenager's room. I have a problem with my young son's tiny room and all of his "stuff." Would you please make some suggestions for using the awkward space efficiently. Thank you. P.S. Nothing can be attached permaÂ­nently to these surfaces due to vinyl coated paneling over concrete block. A: Small rooms, children and their "stuff seems to be forever a dilemma to many people. I receive many letters dealing with similar problems. 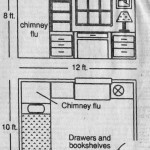 Your son's room is rather small and the dead space in the corner, due to the chimney flu, doesn't appear to help the situation. However, when you graph it out, I think it actually does help. In a room this size, I would not "L" the bed into the room, but would put the length of the bed against the far wall. This will not cut the room and makes the most of the floor space. The dead space serves as a headÂ­board for the bed and just happens to be the right size. I would purchase a platform, bed that has storage drawers that pull out from underneath. These can be used for his clothes or some of his things. Granted the foot of the bed is close to the closet, a little less than 2 feet, but I think it's workable. The closet is a nice size. I would advise hanging up as many of his clothes as possible. This will not only free up drawer space for other things, but also keep his clothing neater. You will probably want to have two clothes rods in your son's closet instead of only one. This will double the usable space. Hang one approximately 36 inches from the floor and the other the same distance above that. On the wall next to the closet, even considering the 3 feet necessary for the door swing, you have enough space to put a 3-foot chest. I would purchase a low chest and put a hutch with bookshelves on top of it. 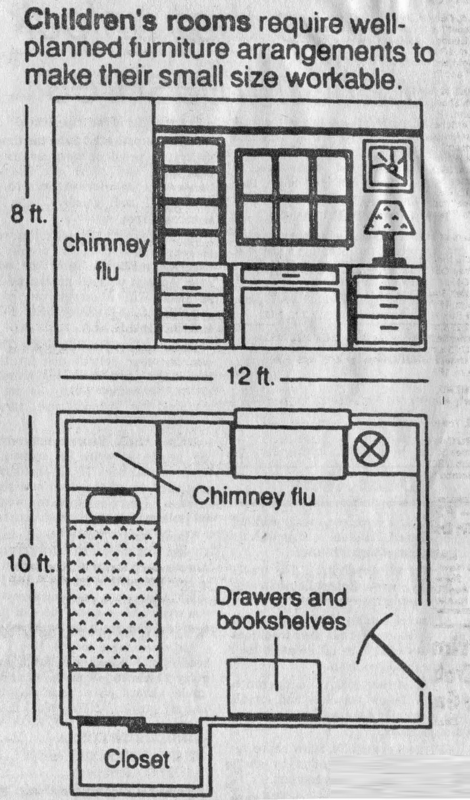 I think this would be preferable to a tall chest because he should have enough drawer space in the room and can use the shelves to display things. The wall next to the door I would leave mostly blank to give him some floor space to play. Again, the dead space in the corner almost becomes useful because it creates a 2-foot by 8-foot-8-inch niche. It is a perfect size to put a 42-inch desk under the window with a 30-inch low chest of drawers on either side. Because all three pieces are the same height, it really won't matter too much that the desk isn't exactly centered under the window. It will hardly be noticeable â€” probably only to you because you're aware of it. On the chest next to the dead space, I would again advise putting a bookÂ­case unit on top of it. You won't be able to do that on the other one, due to the window, I would balance it by putting a lamp on the other low chest and hanging a picture above it. Perhaps you choose not to permaÂ­nently attach anything to the walls, but it is feasible. It would mean drilling holes into the concrete block and inserting lead shields which would provide a secure anchor for the screws. You could then consider installing a shelf around the perimeter of the room to display things that are either decorative, or things that he doesn't use very often. This concept can be very effective.